We are proud to be members of the Canine Hydrotherapy Association (CHA) the only hydrotherapy association to audit and inspect their centres. We are an AWARD WINNING CENTRE – The ONLY Hydrotherapy Centre to be awarded ‘Outstanding Hydrotherapy of the Year 2015’ by the Canine Hydrotherapy Association. We offer quality, safe and caring treatment sessions for your dog. 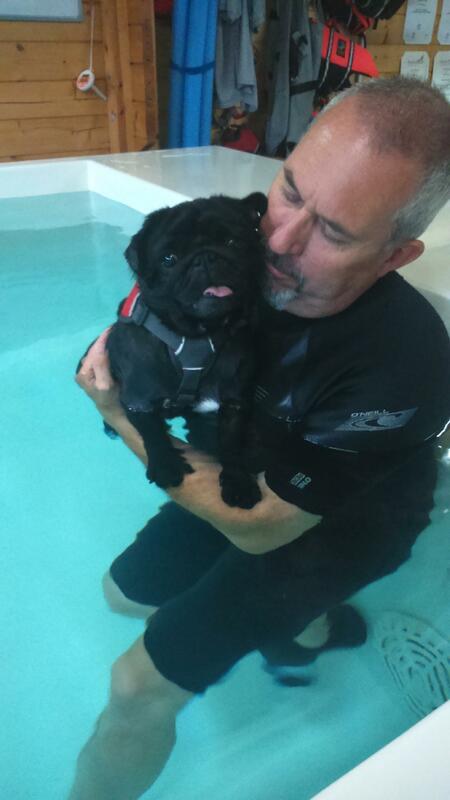 Your dog will ONLY be assessed & treated by a fully qualified canine hydrotherapist. Hydrotherapists at Splash Paws will complete a minimum of 30 hours Continued Professional Development (CPD) every year. The ONLY canine hydrotherapy centre in the UK to have TWO Premium Physio-Tech Underwater Treadmill. Your dog will be the ONLY dog in the hydrotherapy room … it’s all about the quality of treatment! Splash Paws is owned and run by Graham & Julie Cooper, the Centre is situated in Staplehurst, between Maidstone and Cranbrook, Kent. We offer 1-on-1 hydrotherapy sessions for your dog. We are a small, friendly centre, with two fully-qualified hydrotherapists, providing the latest equipment in two purpose-built log cabins with heating or air conditioning for your complete comfort. So that you get 100% attention and care for your dog, no other clients or dogs will be in the centre during your appointment. Our aim is to improve the health, mobility and mental well-being of all the dogs that come to us, the welfare of your dog is the most important thing. Hydrotherapy can help with many medical conditions. It offers weight bearing exercise in heated water which can assist those recovering from injury or surgical procedures, suffering from orthopaedic problems and many others. It is also a great way of getting or keeping your dog in a great physical condition, so we also offer fitness sessions for agility or show dogs. EACH HYDROTHERAPIST WILL COMPLETE A MINIMUM OF 30 HOURS OF CONTINUED PROFESSIONAL DEVELOPMENT PER YEAR. THE CHA QS REQUIREMENT IS 25 HOURS!